When you hear the word “Casino”, your mind lands to a place filled with dice, cards, arcade machines, chips and of course, lots and lots of money. Las Vegas is one of the first places that comes to mind when we think of casinos. A casino dealer earns about $7 to $10 an hour depending on his experience. If you enjoy gambling, or just have a knack for it, becoming a casino dealer might be the dream job for you. But mind you, it is not a job for everyone. Becoming a casino dealer isn’t all about playing games through your working hours. In order to become a professional casino dealer, believe it or not, you will have to go through a casino training school! So if being a casino dealer seems like the ideal job for you. Yes, you read it right. You will have to get professional training done from a dealer school, or a vocational course. These casino courses are provided to fully train you on how to play casino games such as blackjack, roulette, craps, poker, etc. They teach you insider secrets on how to increase your probability of winning at every game. They will train you on the actual mathematics required to count and shuffle cards, and handle chips. When you are gambling at a casino as a guest, you need to have good knowledge of the game, and also have a good stroke of luck along with you, in order to win. But when you are working as a casino dealer, you have to anyhow increase the chances of you winning the higher hand at the game, since it is going to be a profit for the casino, and eventually, for you too. The games which are played in casinos, such as poker, blackjack and craps work on highly complex (or simple, if you are a genius) mathematic rules. In order to increase your chances of winning a hand at the table, you must be able to calculate probabilities and decipher what the value of your opponents’ card is. On top of that, you will need to have multi-tasking skills, as working as a professional casino dealer means you will have to work with more than one table at the same time. You will have to keep in mind the values and scores of each player of the table, and still be able to crunch the numbers at warp speed. 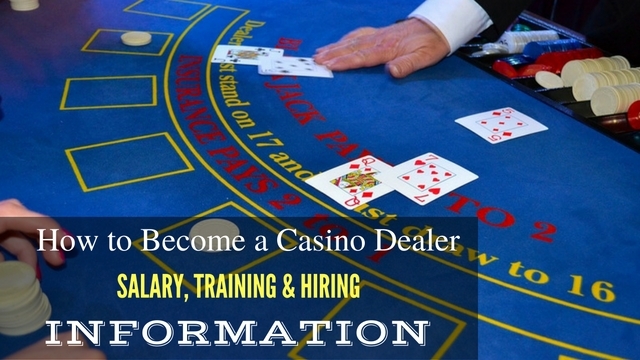 Once you are through with your casino dealer school training, you will have to apply to the casino of your choice to become a dealer. Here, not only will they test your skills at the game and handling possibly drunk clients, you will also be required to provide a detailed history of yourself. This information can range from your last job and employers information, to where you grew up and studied, to your family history, your medical history, and divorces, criminal records, or any other information you can possibly think of! Casino dealers must provide complete transparency in their backgrounds, as the casino management wants to make sure that you are not joining their team for the wrong purposes, or you do not have any reason to steal from them. Since you will be basically dealing with raw, hard cash, every day since then, the casino management has to make sure that they are hiring someone of good credibility. When working at a casino and working as a casino dealer, you must have complete knowledge of the rules of the game, as well as the rules of the casino inside out. If a dealer is himself not sure of the rules of the game, it will be considered a loss to the integrity of the game. You will have to learn the rules, the tricks, the cheats, the shortcuts and the winning strategies of all the popular casino games. These range from poker, blackjack, craps, dice games, a roulette game, bingo, and even be able to work the arcade machines and slot machines. Not only do you need to have basic knowledge of the slot games, you have to be proficient in it. When you are working in a casino, you will come to realise that there is a complete language of its own. Words like “Action”, “Baccarat”, “Banca Francesa”, “Blind Bet”, “Comps”, “Cut Card”, “Flat Card”, are terms you have to know like the back of your hand. If you are unable at any point of time to keep up, the casino has the right to fire you straightaway. Along with raw knowledge of numbers and having the rules of the game imprinted in your memory, you also must have very good mechanical skills. This means the way you deal with the cards, shuffling, dealing, throwing, the way of a rolling die, everything has to be done with a certain attention and grace. For example, while shuffling the cards, you must be sure never to hold the card too high, or you might give an unfair advantage to a player as he might be able to read the bottom cards. You also have to be very careful and consistent in dealing your cards, never letting your technique falter. These hard skills and soft skills are both required in order to be a good casino dealer. When working as a professional casino dealer, you must remember that you are working in the hospitality and entertainment business. It is essential for you to have a good personality, be warm to the customers, and interact with them. You have to be able to create a good bond and trust between you and the customer. Just like when customers enter a bar, usually they look for their favourite bartenders, who will ask them how their day was, serve them their favourite drink, and chit chat with them. Similarly in a casino, the customers look to be friends and talk with the casino dealers. Casinos will also encourage you to talk to the customer as it can be used as a good strategy in certain cases. The customer is more distracted with the conversation, which in turn helps the casino dealer to win the higher hand at the game. But in order to do this smoothly, the casino dealer must be able to multitask between the conversation and the game. This is a common thing which we all are aware of- when working as a casino dealer, you have to deal with tons of raw, hard cash. So obviously, the priority of the casino will be to ensure they are hiring someone who is of credibility. You must have a clean track record, no criminal records and all in all have to be loyal towards your workplace. It is very easy for anyone to get swayed seeing the amount of money casinos deal with on a daily basis, but in order to prove your worth to the casino, you must have immense will power and loyalty. When dealing with guests playing, you have to be able to calculate and keep in your mind how much payoffs are to be given to each player. It is considered completely unprofessional to constantly look down at the table to calculate how much each player’s payoff is. Hence, you need to have a strong and sharp mind, and be focussed on your tables all throughout your game. There are high possibilities of guests playing hank panky, where they will try to cheat or count cards, you have to keep a keen observant eye on each guest at your table and be able to catch anyone whose moves are even slightly suspicious. Some casinos give casino dealers authority to remove guests from the tables or even ban them from the casino, if the need arises. While you might have the normal 9 hours shift as a casino dealer, in reality, you are expected to play for one and a half hours at a stretch, and are then given a break of half an hour. This is because a casino job is extremely strenuous, not only physically but also mentally. You have to be alert at all times, and most of your work involves standing and playing. You have to be extremely physically fit to endure the hours at a casino. While you might be working in shifts, casinos are open 24 hours a day, so you might be expected to take a late night shift, while you will have to comply with. A casino dealers job is not just to know the rules, play the game and win but, a casino dealers job is also of entertainers. As a casino dealer, you are expected to have above average communication skills. Having witty remarks and interesting anecdotes up your sleeve are always considered a plus point in the casino world. You are expected to create a rapport with the guests. As soon as guests start to like a casino dealer, it is seen that they return to that particular dealer the next time they come to play. This is advantageous not only to the casino, but also to the casino dealer. More guests equals more money flowing in. The last, but not least in importance, is a skill which is very much required but very hard to find. As a professional casino player, you have to be ready to deal with all kinds of guests. This means some guests will be nice to you, some may be drunk, some may be moody and some may be outright rude and unpleasant. As a casino dealer, it is your job to deal with these kinds of guests with a thick skin. Anything they say to you should not be taken as face value, and should never be taken personally. You have to be able to create a calm atmosphere around your table for the other players, and in case you are dealing with a particularly difficult guest, then just call the security! A casino dealer’s job is one filled with varying tests of skill, enjoyment, as well as hardships. But if you enjoy your job, it can be one of the most satisfying things you have done. After all, who doesn’t like playing their favourite games, and getting paid for it!